The Czech lands were affected by an economic depression under the reign of Wenceslas IV, the son of Charles IV. Highwaymen and plague epidemics racked the country, while private wars raged. The Church, which was supposed to supervise the observance of God’s commandments, focused on attaining positions of power and accumulating property. Clergymen had long been performing jobs in the royal administration and instead of money they received a church office as settlement. Criticism of the Church grew stronger due to its deviation from its original principles, not just in Bohemia, but all over Europe. Critics considered a return to the original ideals of the Church to be the remedy to this situation. They demanded that the Church renounce secular power and extensive property, which of course it didn’t do. 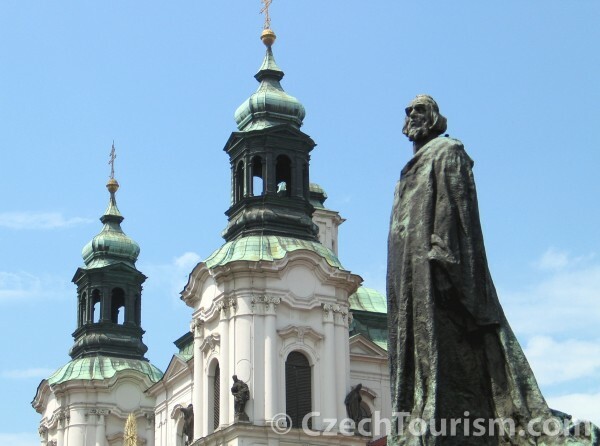 Master Jan Hus, a teacher at Prague University, preached at the Bethlehem Chapel. For him, the Bible was the greatest paradigm for living and the highest authority. He promoted the idea of a poor church. Coming closer to the perfect world of God was supposed to be the purpose of earthly endeavors. According to Hus and his followers, the disintegration of contemporary life throughout the country was indicative of the imminent arrival of the Anti-Christ. The German teachers at Prague University did not agree with Hus’s opinions. They apparently complained to the Pope himself about the alleged Czech heretics. Angry at the damage done to the reputation of the kingdom abroad, Wenceslas IV took retaliatory measures. By way of the Decree of Kutna Hora in 1409, he placed control of the university into the hands of the Hus faction. He changed the rules of voting so that the Bohemian nation received three votes as opposed to one joint vote for all foreign nations. This resulted in a deep rift leading to the departure of German teachers and students to other imperial universities. The king initially supported Hus, but Hus’s criticism of the selling of indulgences and the worsening reputation of a kingdom where the king apparently stayed his hand over a heretic changed the situation. The pope declared an interdict (i.e. a ban on church ceremonies – funerals, weddings, christenings, etc.) on Prague for as long as Jan Hus resided there. Part of the Church tried to resolve problems (primarily consisting of a schism) with the aid of councils. And this was timely, because in the second decade of the century, Europe had no fewer than three popes wrangling among themselves. Jan Hus went to the Council of Constance, which had been called by the king’s brother Sigismund Luxemburg, in order to defend the rightness of the Bohemian remedy for the Church. His efforts were in vain. He did not convince the Church dignitaries, and he refused to renounce his opinions. On July 6, 1415, he was burned to death at Constance. Today, this date is commemorated as a national state holiday in the Czech Republic. The delegates at the council managed to end the papal schism. The Czech Reformation, overtaken the Reformation in Europe, which relies on the Augustinian monk and university professor Martin Luther, by a hundred years. Martin Luther agreed, after he read the texts “about the Church” Jan Hus, in line with the Czech Reformation. In 2015 of the 600th anniversary of the death of John Hus leading to 2017 and the 500th anniversary of the Reformation. Especially in Prague and Southern Bohemia region are several scenes, which are related to the work of the famous Czech reformer John Hus. Regardless of when you visit, there will always be special events in for you to experience and enjoy!